Revolution Slider Error: Slider with alias case-study-dominoes not found. Imaginators were asked to develop a unique match-day experience for club sponsors for use at Wembley Stadium for a half-time kicking competition. 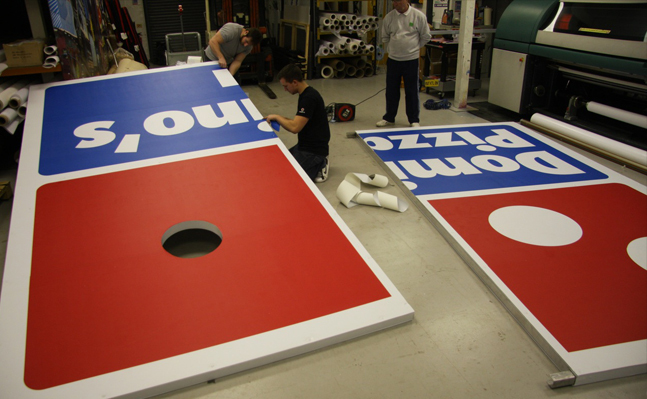 A giant three-dimensional 8m2 pizza box was created completely in-house with a variety of technical issues to overcome including size, materials, weight, logistics, match-day activation and storage together with ensuring a close remit to the instructions of the client and the objectives of the competition. At half time throughout the rugby season this giant pizza box would be brought onto the pitch. Imaginators provided crew to pre-assemble the structure in the service area of Wembley Stadium and crew to transport the structure onto the iconic pitch. Once secured to the uprights using unique temporary methods of fixing the kicking competition began. Constructed in two sections from lightweight aircraft grade aluminium, the frame was clad in flexible, lightweight branded panels digitally printed direct to media using flexible UV inks which were packed with fire retardant polystyrene. In order to provide strength and rigidity, Imaginators developed interlocking fixings to ensure the match-day experience ran smoothly in-front of capacity crowds at this televised sporting event. Imaginators were responsible for the concept, manufacture, logistics, match-day activation and storage. Website Design by Brilliant Ltd.